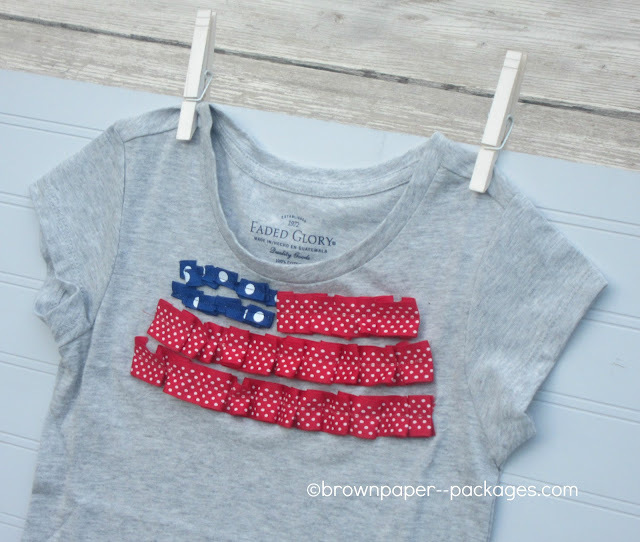 I wanted to make a fun tee for my girls to wear on the 4th of July, and I needed it to be quick and simple. I just had a couple more days before my sewing machine would be packed away, and I didn’t have a lot of time to work on it. 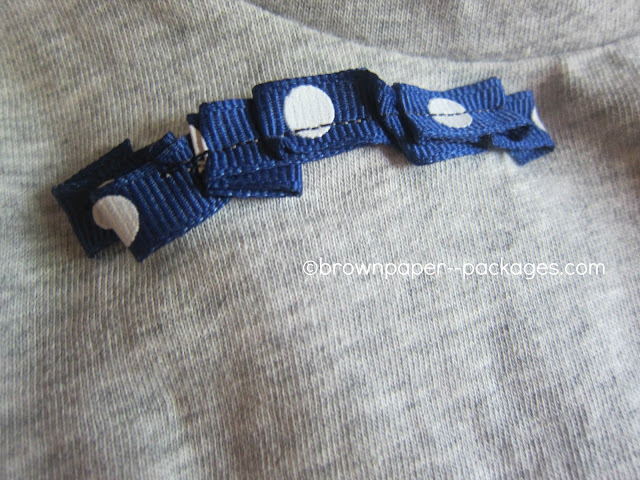 So, I grabbed two spools of ribbon, some thread, and grey tee shirts I found at Walmart for $3. Less than 30 minutes later, I had two darling shirts, ready to celebrate in! Okay, no judging here. Lol. I am by no means a seamstress, and I know that there are plenty of you out there that are. So, please don’t look too close at my stitches—I’m just happy that they look pretty straight! Just know that if I can do this, you can too! This is super easy! I used my favorite ruffling technique, like I did HERE and HERE. I used two strips of navy ribbon, but I almost wish I would have done three. I used two because they were the same width as the red ribbon, so I’m okay with it. The one thing you will absolutely want to do is pin your shirt A LOT–where you want the stripes to begin, and end. Tee shirt material is super stretchy, and I learned that the hard way, lol. It’s why my ribbon ruffles aren’t the same length! I did pin, but not nearly as much as I needed to. 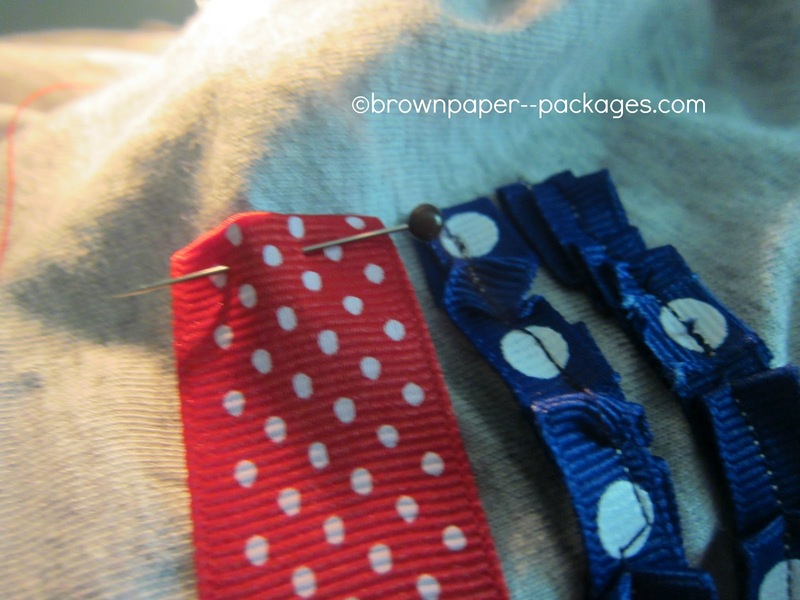 These are pins for the top section, showing where the blue ribbon will start and end, and where the red ribbon will begin and end. 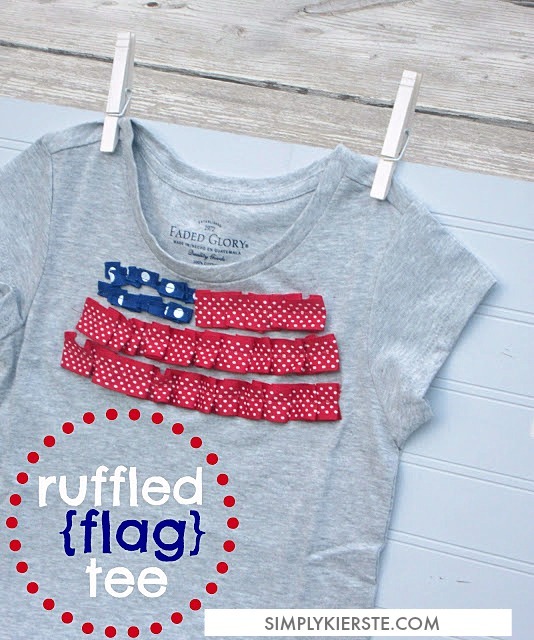 Make sure to pin where you want the ruffle to end. This pin is for the red ribbon the top row. 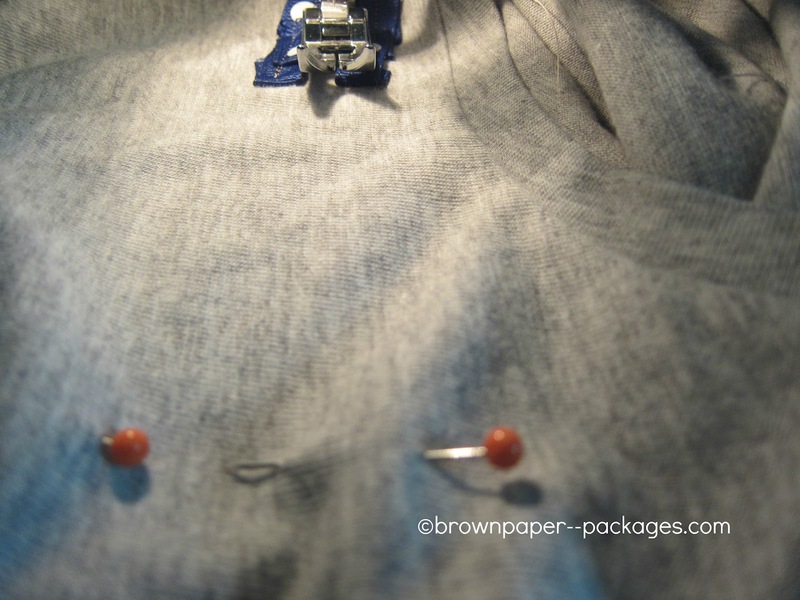 suggest pinning the ribbon to the shirt, where you want the ruffle to be, before you start sewing. 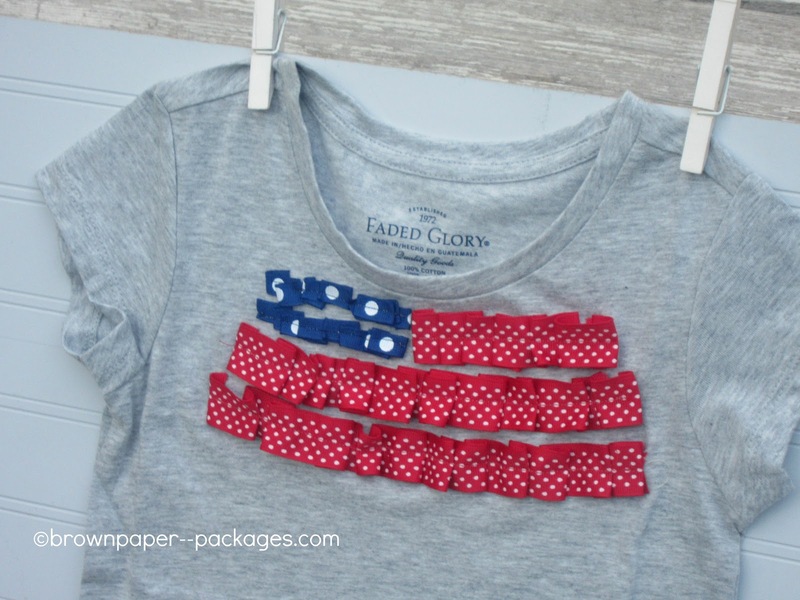 Here is as close up of the ruffle–totally easy–just fold the ribbon forward or backward and sew! Love it! I used one spool of the red polka dot ribbon for two shirts (9 yards), and just a little of the blue ribbon. The overall cost for two shirts? Less than $5 a piece! You could it for less, too, depending on what materials you already had at home. 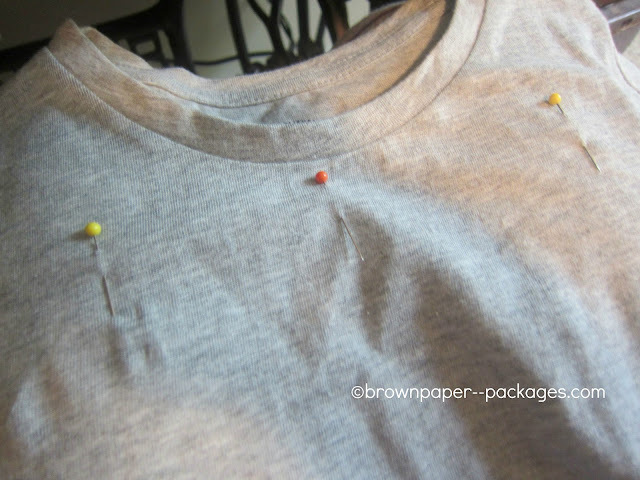 This is a great way to re-purpose older tee shirts, that perhaps have a stain on the front. The ruffles could cover it right up! You might already have ribbon at home, too. My girls love them, and so do I!